There are so many fantastic things to read in the blogosphere. Things that make me laugh or cry. Things that make me angry or roll my eyes. Things that inspire me or educate me. Recently I read “In Defense of an Ordinary Day” by Dawn Camp on (in)courage and I was touched. The gist is that there are so many things to be thankful for when you have ordinary moments in an ordinary day. It was the right time for me to hear this and I felt that God nudged me to listen to it. Later on my Facebook page, I shared a picture of a messy Barbie pool and my face towel on the icky bathroom floor because my daughter had used it to clean up. The comments helped me appreciate the beauty of this ordinary, if not messy, moment. “At least she cleaned it up”, wrote one. “Later in life you will realize nothing matters but the memories of hugs with your cute kid,” wrote another. Both so true! What was a minor inconvenience to me was truthfully a funny, dear moment with my child. My child who is growing up way too fast. Then this morning, just another Tuesday morning during the school and work week, I stood at the top of the stairs calling out goodbye to my twelve-year-old before he left the house to catch his bus. Because of the timing of our schedules, I’m often prepping for my day when he leaves. But this time, I was finished and I wanted him to know in small, ordinary way that he was loved. After I called out, he ran up the stairs. Then he looked out the front window to make sure he wasn’t seen by anyone walking by on the street and he hugged me. His little sister, who was upstairs as well, raced to us. She wrapped her arms around the two of us embracing. It was a sweet, spontaneous moment. Magic. Beautiful. I encourage you to find the magic in your day. A kind word or look. A hug or a light touch. Pretty scenery. A coincidence that is really God putting someone or something in your path. Life is beautiful. Ordinary moments are beautiful. We just have to see them. Aw, thanks. I can’t take the credit because I think that’s how I felt when I read the original post on (in)courage but I’m pleased I can pay it forward! Aw, Katy. Thank you. Such a lovely post to wake up to. My heart melted a little bit when I read that he looked out the window to see if anyone was looking before he hugged you. They DO grow up so quickly. And then they’re away at college and startle you with a fervent “I love you” over the phone – and you can hear their roomies in the background. You know they heard the “I love you” as well and that your son no longer minds the displays of affection. It’s still early here and I do thank you for starting my day off well! Have a good one yourself. One of the best parts of blogging is knowing people like you and knowing that you can relate to what I wrote. And getting a peek at what my future may hold as my kids grow up. I hope I get the phone call and the I love you in college! I feel strongly about the beauty in ordinary moments. It gives you the power to find the positivity within yourself and your life. Embracing nature, the universe or a spiritual power helps with this, too. Wonderful post. Thank you Caryn! I like how you noted it gives you the power to find the positivity in yourself and your life. So true. Thank you, Laura. I’m glad you liked it and thanks for visiting! What a precious moment in a group hug with your son and daughter. Those are the absolute best memories that we forget too soon. 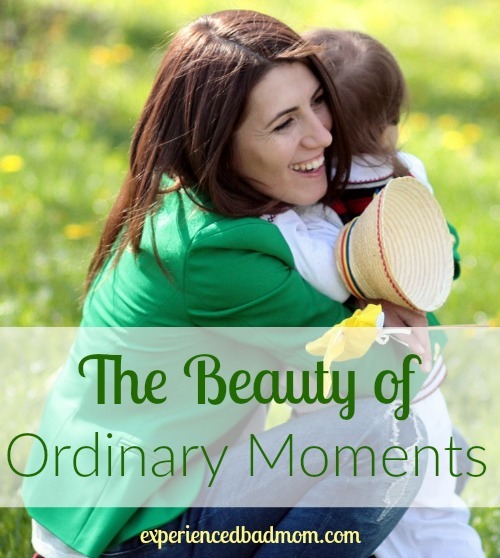 Ordinary moments, yes they are so incredibly beautiful :). Thank you for this important reminder! I’m glad you can relate. Thanks for visiting! It’s a good life, isn’t it? Oh my goodness that moment with your 12 year old and your daughter, magical. Sometimes it just gets so busy and I often tend to see the chores associated with my kids rather than the magic of even the smallest of moments that happen around me all of the time, but when we see them and really feel them like your hug, they fill our hearts pretty completely. And make the whole parenting thing pretty dang awesome! I agree – they do make the whole parenting thing pretty dang awesome! Wendy recently posted…Need a Dose of Happy Today? 15 Free Ways To Make Today Brighter! Hi Katy, a price cannot be put on the simple everyday things that give us pleasure in life. I’m sat here tapping away on my keyboard and the sound of the birds chirping outside fills me with happiness and they will continue to do so tomorrow, the day after that and hopefully for always. Having that simple hug with your son before he went to school is simple, but perfect moment, even if he did feel the need to check that no one could see him. Thank you, Deb. I love that the sound of the birds chirping can fill you with happiness. I enjoy that sound too – except maybe at 5:30 am some mornings when the birds want to get up before I want to get up! Now I”m gonna cry! My littlest lost his tooth at school yesterday. Can you believe that in 12 years of parenting and three kids, this is the first tooth that was lost at school!?! I didn’t get to see him last night before bedtime either because I had a meeting. It was his first tooth and I feel badly that I missed it. Those little moments are so special! Absolutely beautiful! As someone who has graduated from those “sending them off to school” days, I second the idea of enjoying every single second. I’m so very thankful to now have grandsons who bring me joy with a hug and an “I love you Momo!”. Life is good! It IS good, Mo, isn’t it? Enjoy those hugs.